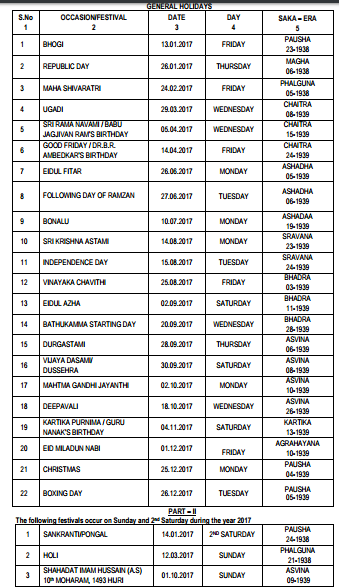 TS General Holidays and Optional Holidays for the year 2017 as per G.O.NO:2529 Dated:22/11/2016>>Telangana Government Declared 2017-2018 General Holidays and Optional Holidays>>TS G.O.NO:2529 General Holidays and Optional Holidays for the Acadamic year 2017-2018>>Telangana G.Os>>TS G.Os. HOLIDAYS- General Holidays and Optional Holidays for the year 2017 – Declared. 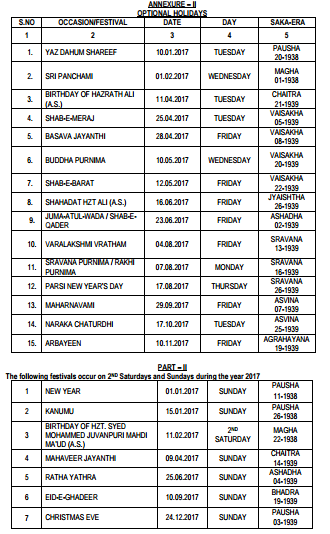 The Government of Telangana hereby notifies that during the year 2017 the days specified in Annexure-I (Part I) shall be observed as General Holidays by all the State Government Offices while the days for other occasions/ festivals which fall on Sundays are shown in Annexure-I (Part II) and also notify Optional Holidays for State Government offices as shown in Annexure-II( Part I) while the days for other occasions/ festivals falling on Sundays are shown in Annexure II (Part II). The State Government directs that all offices under State Government shall remain closed on all Sundays and Second Saturdays in all the months during the year 2017. The Government also directs that General Holidays shall not ipso-facto apply to the Industrial Establishment and Public Undertakings under the control of the State Government, the workmen engaged in Public Works Departments and Educational Institutions in this State. Separate orders regarding the festivals/occasions when these Institutions observe holidays shall be issued by the concerned Administrative Department of the Secretariat. If there is any change of date in respect of Idu’l Fitar, Idu’l Zuha, Muharram and Id-e-Milad as per the moon sight or any other holiday declared now, it shall be announced through electronic/print media. All the Departments of Secretariat, Heads of Departments and District Collectors shall take action according to such an announcement and without waiting for formal order about the change of date.